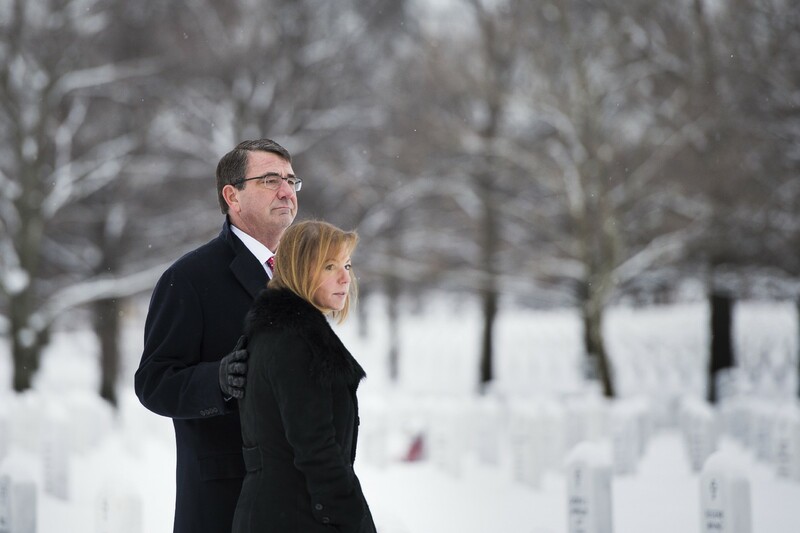 On February 17, 2015, my husband was being sworn in as the Secretary of Defense — a job his years of work at the Pentagon had prepared him for and the crowning achievement of his career. I could not have been prouder and I had gushed to friends that it was like “seeing Secretariat run the Kentucky Derby”. We had started the cold, snowy day at Arlington Cemetery in Section 60 visiting the graves of our fallen. It was somber and quiet and the weight of Ash’s new responsibility was palpable. Upon our arrival at the Pentagon, I had slipped and fell on some ice — which a few journalists were nice enough to tweet about. Later, we went to the White House for the swearing in and I was feeling self-conscious and tentative (not a normal state for those who know me) about the fall — and perhaps about how much our life might change. As we walked in the room, reporters were staged and a young woman from Huffington Post shouted to me to ask if I was doing all right — I was somewhat thrown (did I not look all right?) but quickly remembered news of my fall on the ice had traveled. By the time then-Vice President Biden had arrived, he could sense I was uncharacteristically nervous- and quickly gave me a hug. After the swearing in, as Ash was giving remarks, he leaned in to tell me “thank you for letting him do this” and kept his hands on my shoulders as a means of offering his support. But a still shot taken from a video — misleadingly extracted from what was a longer moment between close friends — sent out in a snarky tweet — came to be the lasting image of that day. As I arrived home to my apartment that night, I was starting to get a sense from incoming texts that that picture was picking up steam. I got on the elevator and must have been too lost in thought to notice someone next to me. As I got off the elevator, the young woman started walking down my hall (which I found odd since there are few apartments leaving very few doors she could be going to) and began to feel her footsteps pick up close to mine. As I reached my door, I turned around to find her practically on top of me. When I confronted her, she said she was a reporter from the New York Post and did I have a comment about that picture. I quickly went inside and locked the door. It didn’t stop the next day, or the day after or the day after that. Friends tried to comfort me — they knew we had known Joe and Jill Biden for many years, long before he had become vice president, and that this presumption on the part of reporters wasn’t the type of attention I wanted. Ash tried to joke that it was the only way people knew that he had been sworn in. At his first available opportunity, he told the press that we had been friends with the Bidens for years and it wasn’t at all what people thought. But that didn’t stop people I had not heard from since high school sending me messages — usually with some joke or demanding to know what he had said to me. Meanwhile, when I next saw the Bidens, I told them I felt awful that after he had generously taken time out of his day to swear in an old friend, his attempt to support me had become a joke and even more — supposed proof positive that he didn’t understand how to respect women. I thought it would all blow over if I didn’t dignify it with a response. But clearly that was wishful thinking. I won’t pretend that this will be the last of that picture, but it will be the last of other people speaking for me.